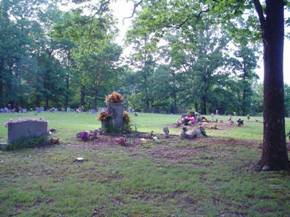 The Copeland Cemetery is located near the Highland community north of Collinwood, Tennessee. To reach the cemetery, travel north on highway 13 from Collinwood for approximately 3 ½ miles. Turn right onto Tie Camp Rd. and travel approximately .8 miles. Turn left onto a narrow paved road and travel approximately ½ mile past two residences. This cemetery has a large number of unidentified grave sites. Casteel, infant; b. & d. 06 Apr 1899, son of S.B. & S. A.
Copeland, Ida L.; b. 28 Oct 1888, d. 31 Dec 1890, daughter of Jacob & Mandy A.
Copeland, Mandy A.; b. 10 Feb 1883, d. 11 Sep 1889, daughter of Jacob & Mandy A.
Copeland, Martha A.; b. 16 Jun 1853, d. 07 Nov 1917, wife of R.H.
Copeland, Pearl; b. 08 Sep 1890, d. 16 Nov 1891, daughter of H.J. & N.E. Copeland, R.H.; b. 22 Oct 1841, d. 10 Nov 1912, husband of Sarah J. & Martha A.
Copeland, Sarah J.; b. 04 May 1844, d. 20 Jul 1870, wife of R.H.
Dixon, Beulah; b. 22 Apr 1899, d. 06 Jan 1922, wife of W.M. Kilburn, Dorcas T.; b. 23 Aug 1849, d. 26 Feb 1897, wife of R.P. Lynn, Ruby (Simmons); b. 14 Oct 1926, d. 21 Jul 2009, wife of James Thomas Lynn Sr.
Ray, Martha B.; b. 10 Nov 1870, d. 15 Jan 1918, wife of A.F. Risner, Alfred; Co. “E” 2nd Tennessee Mounted Inf.